I was off of work all this week (woo for vacation time!) so it was a great week of relaxing along with working out. Plus I had a great Turkey Trot 5K. Let’s get into it! A great cross training day, I'm over the cold from last week and was able to push myself again! I'm also excited that I bumped up the weights and it didn't feel as hard as I thought it would. Still had to give it a little bit extra on the last couple of reps but I still had great form. One of the best parts about vacations is getting in my speedwork before the sun goes down! 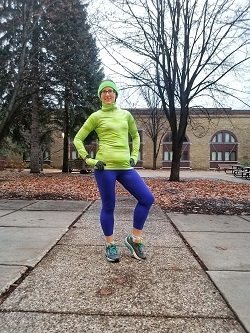 It's getting cold in Minnesota but my tempo run still felt great. I was debating doing this versus an easy run since I have a turkey trot on Thursday that I'm hoping to PR at. But speedwork won out because it's fun! Another great day of cross training done! I moved it from Thursday to Wednesday since I was planning on racing at a Turkey Trot on Thursday. It was so nice to do weights at the gym when it's not crazy busy. Plus I got in a good 45 minutes on the elliptical. n awesome day for a 5K and I ended up with a new 5K PR! The end was a bit shaky with an uphill that I walked a little but got right back on a good pace. Plus then I got to enjoy Thanksgiving with the in-laws. Check out my race recap! Started off this Friday with a lovely yoga class followed by a little sweating on the stairmaster. It felt so good after yesterday's 5K PR! Great feeling run this morning, my legs felt awesome after Thursday's Turkey Trot! Took some extra time at the gym to get in a core session and trigger point release on my glutes. Sunny morning for a long run along the river and Minnehaha Avenue. Kept my pace pretty consistent at the beginning and slowed down in the last mile. Minnesota is back into winter weather again. Even as it colder outside (and eventually we got snow), my runs and workouts still felt great. Plus I took a vacation day and had an awesome yoga class. Let’s get into it! Back to weights and spin class! It was a tough workout but it felt great to get back in the saddle again. Plus, I got to wear my new Nike Flex Trainers which are so cute and comfortable! 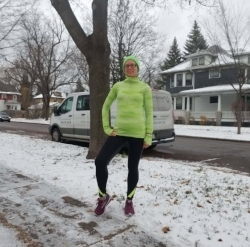 Even with the cold, wind and snow, I had an awesome tempo run today! 9 minute average pace with my build-up section at an 8:33 pace, right around my 5K pace. I'm feeling so good about the Reindeer Run 10K in December! I don't know if it's the colder weather, that I'm getting stronger or a combination of things but this was an awesome run! Averaged a 9:17 pace and it barely felt like I was pushing myself. I can't wait to crush a 10K PR in December! Cross training day today and I'm feeling so strong from these twice a week strength training sessions. My back is really getting tight from it so I'm working on using a tennis ball to target the tight spots every night. Friday is a rest day and a vacation day, I'm so excited to get in a morning yoga class at the gym! I took a vacation day today (since I have a week of vacation days that won't roll over) so it's been a low key day. Slept 9.5 hours (we were worn out and went to bed about 8:30), took Vinnie on a walk in the snow and headed for a morning yoga class! I haven't gone to a yoga class since this summer and it felt so good! I've been mainly doing shorter yoga videos at home and it felt great to get in a full hour. Plus it really helped stretch out my back and shoulders. Great feeling run this morning in 15 degree weather! I felt completely comfortable and just run what felt good. So not even splits but I don't have a problem with that. Awesome feeling long run this morning! The snow made it a little tricky at points but no falls and I got a double digit long run in again. This week was a great training wise, but at the end of it I’m feeling so worn out. I’m sure part of it is because we dog-watchted for my in-laws over the weekend and I didn’t sleep that great at their house, but I know I need to be working more on recovery. I’ve been getting in tons of sleep but my foam rolling and mobility has been so-so (as I could tell when I got my massage). So hopefully this next week continues to go well and I don’t see an effect on how I’m feeling right now! 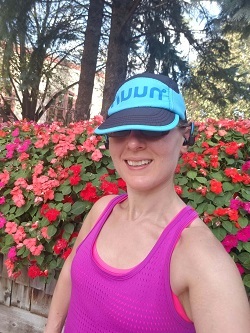 A gorgeous week of running again as I finished off my second week of training for the Reindeer Run 10K. 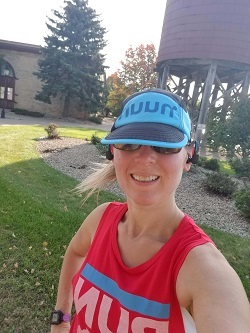 Just one speedwork run this week but I ran a double digit long run for the first time since July. Let’s get into it! I love that my Monday weights session includes a lot of exercises that challenge my balance like single leg deadlifts. It feels so great when I can add on weights like I did today! Plus spin class didn't feel as bad as I thought it would after the tough runs this weekend. I had the resistance down a little bit more and was able to put on a little bit of speed. Gorgeous fall day for a run but I just felt a little bit off on my tempo run. Averaged a 9:09 pace but my form felt off and hips tight. Hopefully some extra mobility work helps out! An easy three miles today, felt so much better than yesterday's tempo run! My hips felt looser than the day before and I could tell my running form was back to normal. One more sweaty cross training day of weights and treadmill hill intervals. I'm so ready for some food and thankfully Mike was just finishing up dinner as I got done! Rest day and I was so worn out. After doing a quick vinyasa flow that felt great in coordinating my breathe with the movements, I worked on making a cheesecake to bring up to my parents’ the next day and took an epsom salt bath. Just what I needed on a rest day! A nice, easy run on a foggy morning. Felt great and I got in some good mobility work in after! A nice easy long run along the river and through the University of Minnesota campus. I haven't run double digits since July but it felt really good to just keep running! Followed it up with a 10 minute core session and mobility work at the gym. 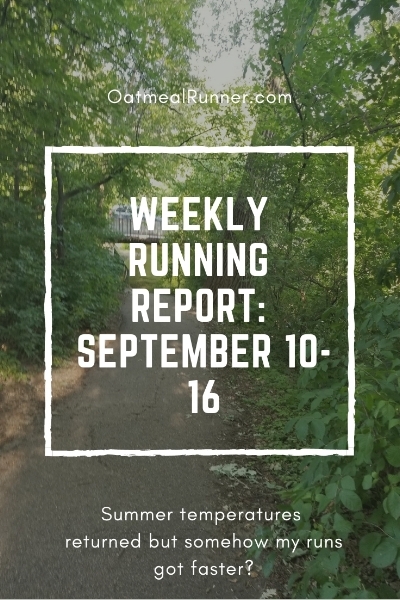 My weekly effort was down from last week, not surprising since I only had one speedwork session and even though my long run was longer it didn’t have as much elevation change. After feeling the tightness in my hips Tuesday and being so worn out on Friday, I know I need to keep on focusing on my recovery and mobility work. I started off this week really excited to be training and see the heart rate feedback from Strava and start doing some more analysis. But by the time I got to Friday, I was excited just to see how much faster I’m running this week even with the heat. Let’s get into it! I rocked my strength training and spin class tonight! Both were tough (plus I did a new workout on the NTC app) but I felt great afterward. In need of carbs (thankfully Mike had a protein smoothie waiting for me at home), but great. I was surprised looking at my heart rate data afterwards that my heart rate didn’t get as high as I felt it did but it’s probably really good for me to get in some moderate heart rate cardio in during the week. Even with the temperature being in the low 80s and my legs/glutes being so sore from yesterday's workouts, I feel like this was pretty awesome tempo run. The speed up section could have been a little bit better but again, heat and soreness made it tougher than usual. I need to get in some foam rolling post-strength training and not just rely on stretching. Well, I wasn't expecting a sub-10 minute pace or the fact that it wouldn't feel that hard. But that happened! I was still feeling soreness from Monday’s workouts but I just went by what felt good in my legs. Another speedy run to close out the week! Even though it was 84, this pace didn't feel that hard. However, looking back at my heart rate data, I was pushing harder on this run than on Wednesday’s even though I had a slower average pace. I can't wait to see how it feels once we get into the 50s! Since I’d been running hard most of the week and did a new strength training workout on Monday, I picked a 20 minute yoga for tight legs video to do after work. Other than that video, I took it easy and just tried to get in my 12,500 steps to make it a nice recovery day. I was feeling good Saturday morning and started off the run with a quick first mile (9:00). I decided to pull back a little bit but wanted to find out if I could hold a faster pace for these five miles after running fast all week. My splits were up and down (with my slowest being a 10:02 minute mile) but it averaged out to a 9:27 average pace. It’s just amazing that even with the heat and humidity, I’m running faster all of a sudden. And I’m thinking part of that is just my mental state around my running now that I’m not racing (more of this to come in this week’s Training Tip Tuesday). Another run of trying to push my comfort zone and run a little bit faster. This run felt so good, I explored new places and saw lots of dogs! All of my miles were around 9:50-10 minute pace, with the two other ones being around 10:15. And my heart rate data proved that I was working hard, I spent 50 minutes of this run in zone 3 (tempo) and the rest in zone 2 (moderate) but not so hard that I was pushing myself into race pace effort for the distance. 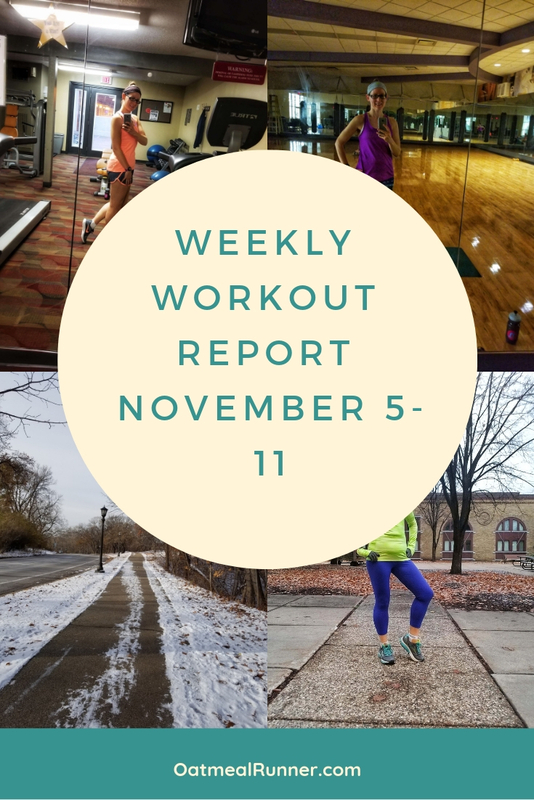 Since is the first week I have heart rate data for my cross-training workouts (weights and spin class), I’m not sure how much it compares to past weeks for weekly effort. But it is showing that I worked harder than past weeks (which my paces show) and I’ve ramped up my effort this week. Even if this isn’t exactly true if I had more heart rate data for past weeks, I will be paying attention to my body this week and doing some extra recovery if needed. I already did some extra recovery to finish off this week with my monthly massage on Sunday. My right side was feeling a bit off, especially my trapezius muscle on that side, so it felt good to get some extra attention paid to that. So we’ll see how I feel in the upcoming week and add in extra stretching or slow down on my runs as needed!